On Sunday, I completed my fourth (and fastest to date) marathon. 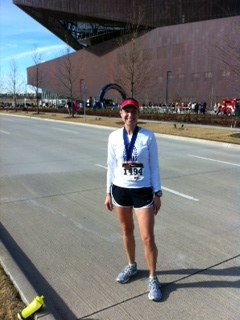 This was my first time running the Cowtown Marathon and I will do what I can to come back again next year. I had a great race experience, and it started by following my plan. It also helped that I had great support and encouragement along the way. My dad, my husband, and my Ironman friend were there at the start, along the course, and at the finish. What a difference that made! The size of the race was ideal for me with almost 1500 finishers in the marathon. At this stage in my running, I need the support of other runners around me. Even in the first ten miles before the half marathon split off, the course didn’t feel crowded. The temperature was nice enough for this easily overheated runner to wear short sleeves and shorts. 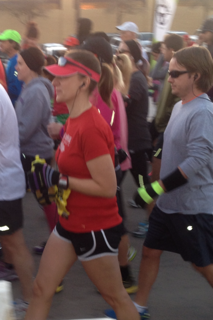 My $1 throwaway gloves were off by the second mile and tucked in the back of my iFitness belt. I put my earbuds in place, my playlist on shuffle (a first for me), and I was ready to go. Focused and ready to run! I stuck close to my pacing plan (five miles at a time) and it went smoothly until miles 17-20 when the wind started to affect my pace. My plan was to run negative splits up until mile 20, when I would use whatever I had left in the tank to finish. It was pretty close, but the last 10k did take its toll on my body. There were a few more hills than I expected, but fortunately I train on hills, so my legs powered up on autopilot. A fun little bonus was when I reached the top of the big hill around mile 9, the theme song from Rocky came on. I couldn’t have planned it any better. While I didn’t quite make my time goal, I did take ten minutes off of my PR from Oklahoma City last April. Also, for the first time I completed a marathon without walking at all. I knew that if I stopped once, then it would be easier to stop again and that would impact my finish. No tears were shed, and I even managed smiles at the finish. My friend and husband both agreed the throwaway gloves needed to be thrown away, so I guess it’s time to hit the clearance to stock up some more. I’m in my taper week for the Cowtown marathon this Sunday, and I should be excited and well rested. But instead, I feel tired. I was going to run this morning, but decided to go back to bed. I haven’t really followed a plan since the Dallas marathon, but I’ve done my own training based on what I’ve studied. So far, it seems to be working okay. I did set a seven minute PR in my last half marathon. This week is where the mental part of the training comes in. I will start to question myself, my training schedule, and my abilities. I will probably have a few times where I think I didn’t do enough long runs – and maybe I didn’t. But I know I can run the distance. I’ve done it before. I know I can manage the pace. I ran my fastest twenty miler last month – in warm temperatures. This is just the mental test, that comes with the extra time on my hands due to reduced mileage. As of right now, the forecast for Sunday in Fort Worth is not my ideal racing climate. But on Sunday, I will follow my plan. No matter how great I feel, I will stick to the pacing plan from my twenty miler. I want to be able to write about a great marathon, where the only tears I have will be from meeting my race goals. 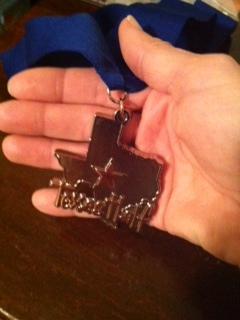 On Sunday I completed the Texas Half in Irving. 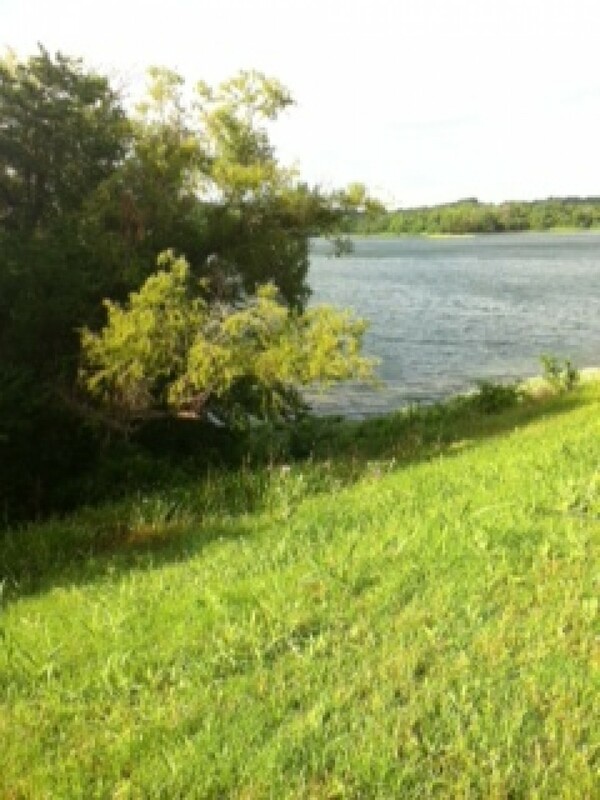 I ran it last year, but the location was at White Rock Lake in Dallas. It was the first race where I broke the two-hour mark (by two seconds) and the first time I ran negative splits in a half marathon. So I guess I’m a little partial. After my race on Sunday, I can say this is one of my favorite half marathons to run (especially since I won a free registration from Mellew Incentives). The new location had great parking, and there were plenty of indoor restrooms. Major bonus for an early February race. The weather could not have been better for a half marathon. I should have worn short sleeves. I was only in the second mile when I pushed my sleeves up. Before the race, one of my friends told me he thought I had too much gas left in the tank at the end of the race. I needed to push it harder. My other friend told me I could run a 1:53:00. My plan was to run under 1:58:00. That would put me around a 9:00 pace per mile. I didn’t want to push too hard since I have the Cowtown Marathon in three weeks. I decided to implement the pacing strategy I used in my last 20 miler. I set my Garmin on the pace screen, and ran a specific pace for the first five miles. By mile four I had settled into a comfortable zone. I originally planned to run 9:00, but at the end of the first five I was near an 8:55 pace. Not wanting to run positive splits, I told myself the next five had to be faster. I also decided not to look at my total time for the entire race. The course wasn’t crowded, and I felt strong. I stuck with my fueling strategy, which included a Nuun tablet in my hand-held and carbs every 5K. I want to avoid any future dehydration issues. The second five miles put me around 8:36 pace. Then I decided to try to lock into my 10K pace for the last 5K. I’ve done quite a few speed workouts that involve my 10K pace, so the pace was familiar even though the effort was hard. I can’t explain how I felt at that moment – to know I had less than three miles and had been running at a pace in the 8 minute range. In the last half mile, I thought my legs were going to lock up on me, but I continued to push and finished strong. 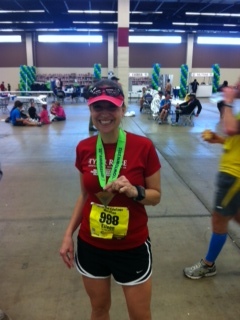 I was pretty sure I finished under 1:55:00, but math never was my strong subject. For the entire race, I had focused more on pace than actual time, so I was surprised to see the finish clock. My official time 1:52:08. This took over seven minutes off of my PR from October! Wow! Maybe this will be the year of my four hour marathon after all.